I know we're out of season for them (At least here in Wisconsin) but it seems every single year I deal with spiders in and around my mirrors and also building webs around my windows and truck bed and my god does it get annoying to kill them only to see them back in 2-3 days. Anyone got any remedies to get rid of the lil bastards? Preferably something that won't damage the paint or finish. A flame thrower works well most of the time but they’re like drug dealers. Get rid of’em and more come in to replace them. Park in a small enclosure (like a 1- or 2-car garage) and set off a few Raid Fumigators with the truck doors & windows open. They kill EVERYTHING, and leave no residue at all (even on dishes). We use them once a year in the house, and often find dead spiders hanging from the ceiling like pinatas. I've also used them in cars with ants. WM sells a box of 3 for ~$13. I usually scream and run away like a third grade girl. I wish, I live in an apartment building and they charge 40 bucks extra per month for a garage space, so opted not to. I park outside and unfortunately it's under trees that I believe contain the little buggers. I've heard people say citrus and then I've heard people say vinegar before, both of which I can't imagine are good for the paint or finish due to their acidity. If at all possible don't park under any trees. Thats where they're dropping from. If you need to park under trees, maybe you can speak with your apartment manager to see if they can spray the trees with insecticide. And show him/her the evidence. I know all about spiders in cars. My old souped up '64 Plymouth was called the 'spider bomb' by my buddies and for good reason. And yes, it was always parked under maple trees. Spiders aren't insects, so most outdoor insecticides have no effect on them. If you're trying to get rid of insects, you WANT spiders. 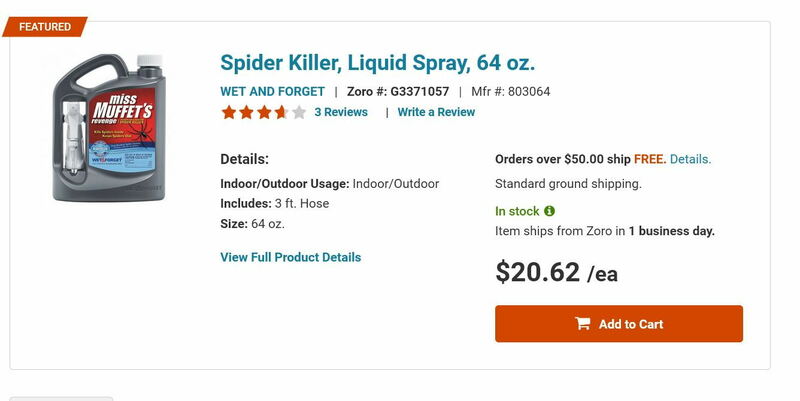 Well, I easily control spiders on the fencing around my house with Spectracide from Home Depot. One of the little bastards stung me out by my pool equipment. Now I spray with Spectracide and alternate with Ortho. No more spiders. And this one in the pic looks promising, LOL, read the name closely.